The West Coast of Mexico is waiting with up to $300 off and up to 65% off when you book by 2/15/18. Planning your family’s spring break doesn’t have to break the bank. Call 877.439.8747 and speak with one of our friendly Travel Consultants today or email info@totallytrips.com! We’ll make sure your family’s vacation is worry and stress free! Where 👀 will your family vacation take you this spring? How about to the All Inclusive Riu Ocho Rios in Jamaica?! This family friendly resort offers something for everyone including: Spa Credits, Resort Credits and up to 38% savings! Couple all that with international buffet and a la carte restaurants, a children’s playground and activity club; romantic wedding and honeymoon services 💋 and daily and nightly entertainment. Now that sounds like the ULTIMATE family vacation! 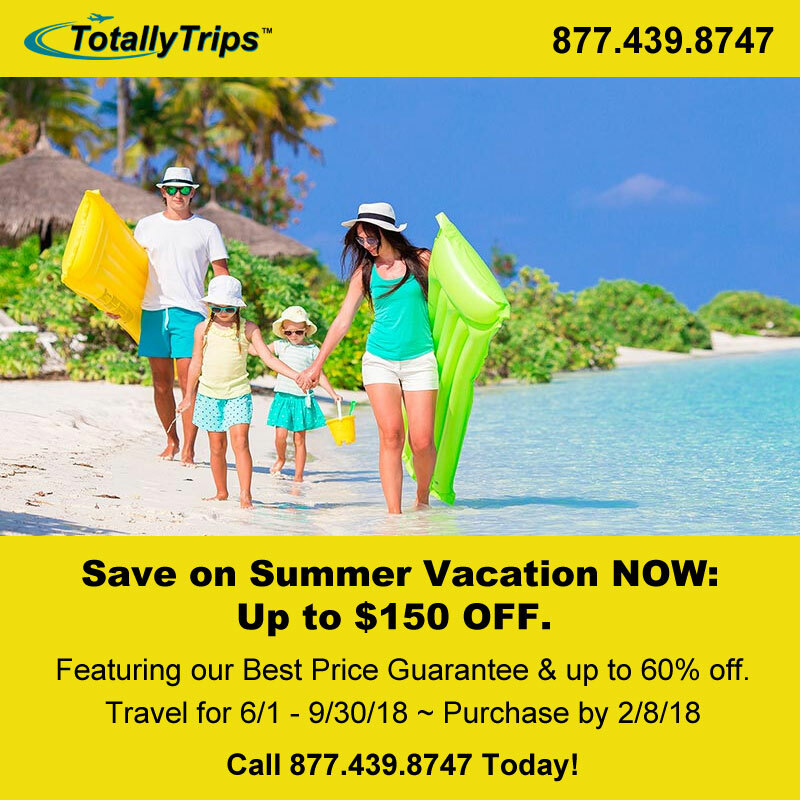 😎 Call 877.439.8747 or visit http://www.totallytrips.com/last-minute-vacations/index today!!! Save on Summer Vacation NOW with up to $150 OFF when you book by February 8th. Save on Summer Vacation NOW with up to $150 OFF when you book by February 8th for travel through September 30th. What are you waiting for, the next big snowstorm to hit??? Now’s the time to book your family’s beach vacation. Call 877.439.8747 today! ALL NEW ALL INCLUSIVE RESORTS ON SALE THIS WEEK! Riu Caribe offers something for everyone. From its beachfront location in Cancun, Riu Caribe offers you the perfect area for enjoying different activities and water sports. If you’re traveling as a family, couple or with friends, you can enjoy the All Inclusive feel with sports like table tennis, volleyball, cycling, golf, catamaran, snorkeling and much more. Your children can join the exclusive RiuLand entertainment program where they can do crafts and activities. Call 877.439.8747 to book your vacation today! European River Cruises are on sale this week! Break out of your daily grind and enjoy up to $200 Off your vacation! Break out of your daily grind and experience the beaches of Mexico, the forest of Costa Rica or the shopping in Jamaica. Now’s the time with savings up to $200 OFF your vacation! When you book by January 25th you’ll enjoy up to $200 savings per reservation and exclusive offers from some of our top resorts. Call 877.439.8747 today! Your Family’s Nickelodeon Vacation Starts HERE!